When you send your campaign, you may want to include an option that allows your subscribers to update their preferences in their web browsers, so you don't need to update their profiles for them. In many cases, this option can reduce unsubscribes, because users can easily change their preferences to receive the information they want. To do this, you'll add the *|UPDATE_PROFILE|* merge tag to your campaign, which will be replaced with a link to the Update Profile Form after your campaign is sent. 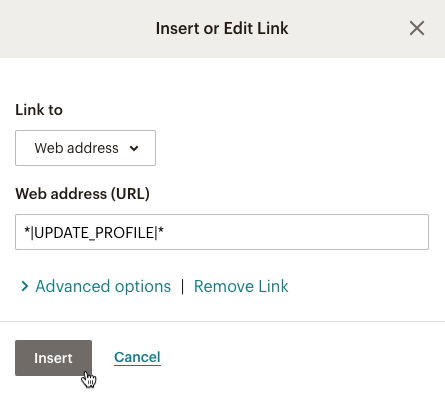 In this article, you'll learn about a few ways to add an Update Profile link to your email campaigns. If you use one of Mailchimp's Basic or Themed templates, we automatically include an Update Profile link in the campaign footer. This process uses the *|UPDATE_PROFILE|* merge tag. We recommend that you familiarize yourself with how merge tags work. The Update Profile link is unique to each subscriber and campaign. For this reason, the *|UPDATE_PROFILE|* merge tag only works after a campaign is sent to your audience. Your subscribers will be sent to the Update Profile Form to update their preferences. It's a good idea to take a look at your Update Profile Form to make sure the design and content is what you want. To add or edit the Update Profile link in a campaign, follow these steps. On the Design step, click the text content block you want to edit. Type the text you want to link, like Update Profile, into the editing pane. Highlight the text, and click the Link icon in the toolbar. Type or paste *|UPDATE_PROFILE|* into the Web Address (URL) field, and click Insert. To add an Update Profile link to your source code, follow these steps. Click the < > Source icon in the toolbar. Add the following code where you want your Update Profile link to display. Click the < > Source icon to return to the visual editor and review the design. If you created a custom HTML campaign or template, you can add an Update Profile link to your own HTML. Type the following code wherever you want the link to appear. You can use Mailchimp's content blocks to turn any text into a link. Learn how to create and style text links in your campaign. Merge tags let you insert dynamic content in your campaigns. Get a list containing each merge tag and how to use it.